Germany Gets Blackberry 8707v | BlackBerry Blast! Vodafone Germany and Research In Motion today introduced the BlackBerry 8707v for corporate and individual users in Germany. The BlackBerry 8707v operates on 2100 MHz UMTS networks and also includes quad-band support on 850/900/1800/1900 MHz GSM/GPRS networks. It features 64 MB flash memory and 16 MB SDRAM. The bright, high-resolution color landscape QVGA (320 x 240) LCD screen delivers vivid graphics and provides ample workspace to view email, web pages, applications and other information. Intelligent light sensing technology automatically optimizes screen and keyboard lighting levels for indoor and outdoor viewing. Users can also easily view popular attachment formats including JPEG, BMP, TIFF, Microsoft(r) Word, Excel and PowerPoint(r), Corel(r) WordPerfect(r) and Adobe(r) PDF. 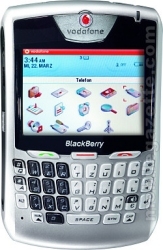 The BlackBerry 8707v also features an ergonomic, full QWERTY keyboard to enable rapid and accurate thumb typing and includes dedicated "send," "end," "mute" and "power" keys. A built-in speakerphone enables hands-free conversation and convenient conference calls. The device can also be used with a wireless headset or car kit via Bluetooth(r).